Recently we've had Stacey Kent, Clare Teal, and Tina May; we've had Patricia Barber, Diana Krall, and Norah Jones. Now is Helen Sheppard's time. 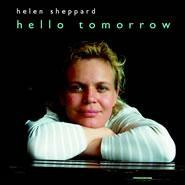 However, Helen Sheppard is different. Her musical identity is so strong, she doesn't have to hide behind jazz standards or someone else's songs - she composes her own songs and writes her own lyrics. She is equally at home in diverse styles of music: soul, blues, ballad, jazz, Latin, etc., and in whatever style she chooses to sing, her musical personality shines through. Both her songs and her magnificent voice are instantly identifiable, and her lyrics have some spiritual connotations. We are proud to present the first CD recorded by this extraordinary talent. It is only a matter of time that Helen Sheppard will perform at the major international festivals and in big concert halls. She has arrived, and those on top will have to make some room for her. Helen has several hundred songs in her archive, but for this CD she wrote new songs which were recorded live without overdubs. Her songs have been arranged by the equally talented composer, conductor, musician, and piano player Tom Unwin whose trio accompanies Helen Sheppard on this CD with Gary Evans on drums and Riaan Vosloo on double bass. Tom has also invited his fellow-musicians to contribute to the recording of some of the songs: Mick Green on saxophone, Martin Holland on trumpet, Tom Drewitt on guitar, and Marc Walpot on accordion.